Tidbits: The fight on Facebook about whether or not I should be in the Communicators’ Hall Of Fame was entertaining to say the least. I am flattered by Murray Brown’s comparison to Stan Bergstein (the only person in both the main Hall of Fame and Communicators’ Hall) and myself — it was sweet, but ludicrous. I loved Stan, he was a great friend and a great teacher as well as one of my biggest fans. But I could never do what he did and he could never do what I did. That said, the posting created a conversation that yielded some very interesting information as well as many compliments and some mildly nasty remarks. It is unfair to make comparisons among writers with diverse backgrounds. To me I don’t care if you are better or worse, I just want to do my thing. After reading the posts all I could think about was what I have often said in person and in this column: negative thoughts are counterproductive and to dwell on negativity depletes your energy and thought process. Unlike Murray, I look forward to 2037 (thank you Gordon Waterstone for the math) when I will be eligible for nomination to the Hall as a Communicator. By the way, it will be three years before my 100th birthday. All my readers are invited to Goshen (Murray will treat). To make matters more interesting my girlfriend Sandy is reading the Trial of Lizzie Borden and just informed me that it was inspiring her. To do what I can only guess. Congratulations to Virginia winning the Final Four in decisive fashion. It was my worst bracket attempt ever. I had 11 teams alive in the sweet sixteen and NONE in the final four. Not easy to do. With Kentucky gone, the Heat on life support and the Marlins awful, I think I have to start watching bowling. Thank heaven for the Masters. I am not giving up on Game Winner yet as my Derby choice. I find it hard to believe that in a six-horse field he was three and for wide the entire distance. Sometimes jockeys believe what the tote board tells them. He has now had two brutal trips in one month, the thoroughbred mind is a little brittle when these things occur and it well may have tainted his entire career. I think Baffert knows the colt well enough to see how he rebounds and whether or not to have him start in the Derby. My final decision will rest on the performance of the very talented Omaha Beach who is scheduled to compete in the Arkansas Derby this Saturday. The Richard Mandela trainee has an amazing turn of speed, however his ability to carry it for a mile and a quarter is still in question. Kudos to the Pennsylvania Racing Commission for showing insight into a situation of a positive test that could have been a severe miscarriage of justice. Gerald Lee Jr received multiple positives for Strychnine, on two different horses. It turns out a supplier of a supplement he was using changed manufacturers and his attorney presented the bottles to the commission for testing and found them to contain the drug. Lee had been training for 30 years without one positive test. ARCI guidelines call for a $50,000 fine and five year suspension. The Pennsylvania Commission took the purse money away and fined Lee $1,000. It is my understanding that the Commission’s decision was based on the fact that his attorney proved to them that he had no INTENT to administer the drug. I totally agree with the decision as the man had 30 years without any violations. However, this is a slippery slope and I would not be so generous in a case where there were numerous previous positive tests. In real life, first offenders are always given the benefit of the doubt why not in racing. Alan Duford asks: All the money in the business comes from a handful of individuals. Is it possible to buy the business? I love the question. Thanks to my friend Frank “The Elder” Antonacci I read Horsetrader for the second time. The rise and fall of Robert Sangster and the story of Coolmore Stud in Ireland and the U.S. With Vincent O’Brien training and the team of Sangster and Magnier they came close to buying the thoroughbred industry for a few years in the 1980s, but to quote Sangster, “the only way to buy the business is to buy them all.” They set the standard, but there is so much big money in the world others quickly followed suit and although the newcomers didn’t quite have the talent or the business model they became formidable competitors in the sales ring and on the racetrack. In horse racing it’s hard to keep a secret who the top horses in a sale are. For almost a decade, the four groups from Ireland, Saudi Arabia, Dubai, and Greece represented more than 20 per cent of the gross sales at Keeneland and Saratoga. On a smaller scale, we had a plethora of heavy hitters at one time, with Pedone, Perretti, Waxman, Wheeler, Suslow, Segal, Siegel and Traub. When I liked a horse, I would shudder to think I had to fight one of them in the ring. There was a lull for a while, but they are back now with Swedish names, both Segal and Siegel still in the mix, Cancelliere and The Bell Group are all able to frighten the gamest buyer. This group only stops bidding when the hammer falls and the bid spotter points to them. Paul Winnick asks: What is your opinion on the big Lasix discussion of late? I am a great proponent for Lasix in human beings. I think for the most part it definitely saves lives and has little downside if used in a judicious manner. On the other side of the coin, I hate the use in horses, but without question it is a necessary evil at this point in time. 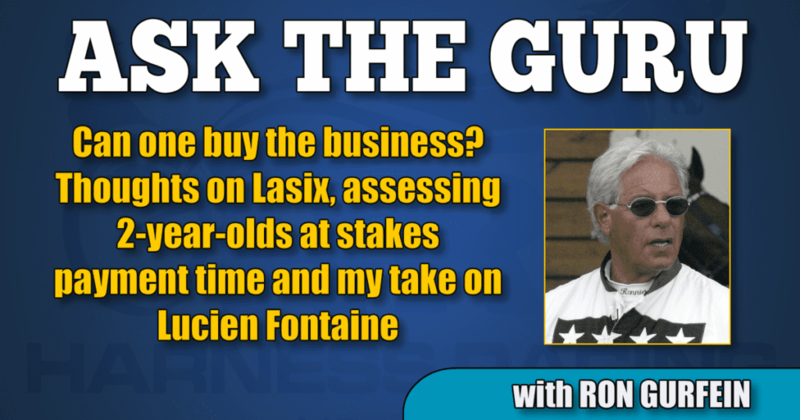 Both breeds of racehorses are severely compromised by lack of entries and to eliminate Lasix would exacerbate the situation to an untenable point. Especially in the colder climates in the winter where bleeding is more of a problem. This is why I think the Stronach group has shot themselves in the foot. The Santa Anita debacle will worsen with the whip ban already in place and when Lasix starts to be eliminated beginning in 2020. Note: there were only six entries in the Santa Anita Derby. This writer thinks the track had much to do with it. I am not saying that down the road we should not eliminate the use of the drug but as of this moment I truly feel it is counterproductive. All horses bleed to some extent, yet there are places in the racing world that have banned the use of Lasix and all other drugs and are doing just fine. Are the horseman in those countries using illegal anti-bleeding medication? Of course some are, but if caught they face career-threatening punishment. In Australia and New Zealand, second time bleeders are forbidden to race, thus you see the influx of Down Under horses in the U.S. today. With racing on the rise as far as profitability, there will surely be an incremental leap in the number of foals in the next few years. If my prediction comes true then that will be the time to resume this discussion but please not now. Murray Brown asks: With April 15 payments coming up, of all your top 2-year-olds, which ones did you know or feel would be top horses? Also, which are the ones you didn’t think were great that turned out to be? I have been told that Continentalvictory fell into that category, is that so? Michel Lachance taught me not to put a bad horse in the box because it demeans your training operation and I listened to his advice. Really ordinary horses I sold or gave to other trainers. If your trying to compare my operation with what goes on in today’s market it’s like apples and oranges. We watch stables that go more trips in a day than I would go in a month, the number of horses is staggering. Most of the time I trained a dozen 2-year-olds and eight or so 3-year-olds and a couple of aged horses. I can honestly say that the only horse that I ever trained that was just okay in Florida that turned out good, not great was my little pacer Lucy’s Pearl. As for horses that were great trainers that ended up great horses I would say all my top horses were great in April. Unfortunately, some of my not so great horses were great in April also. All three of my Hambletonian winners (Victory Dream, Continentalvictory, and Self Possessed) plus Cantab Hall, trained great in the winter. Continentalvictory and Cantab Hall could catch flies they were so fast. I remember schooling “Connie” as a 2-year-old behind the gate at the Meadowlands in May with John Campbell driving one of Chuck Sylvester’s 3-year-olds and beating him on the wire in 1:59. Jogging back to the barn John asked who I was training, I told him a Valley Victory 2-year-old filly. He smiled and shook his head as if I was joking. I am totally convinced that it is far easier to know a good trotter in April than a good pacer. Last season when we left South Florida my two favorite horses were Captain Ahab and Kings County. Both were stakes winners and although they had issues I think they will both be top 3-year-olds. Reed Kiviat asks: I was just wondering how Lucien Fontaine is not in the Hall of Fame? Besides all of his accomplishments he was one of the most popular of his era. Do you think there is still hope that he may get in? I have written many words to the effect I feel the HOF selections have been politically biased for many years. Like any organization of this nature there will be reasons to nominate or reasons to eliminate, none of which at this point do I understand or have any knowledge of. I love “Loosh”, great driver, good friend, had a wonderful wife, Marsha, and a great son, Mark, who did lots of shipping for me when that was his business. His fabulous catch driving was centered in the New York area. Rarely, if ever, did he travel on the Grand Circuit, and was far too class an act to draw attention to himself. Unfortunately, his driving career was cut short by heart surgery at age 49. After which he never drove another race. Was he talented enough to be in the Hall? For sure he was. The abrupt halt to his career didn’t help the situation, but is there still a chance, I would say absolutely, as the conditions seem to change on a daily basis. However it would be a bittersweet day as his beloved wife Marsha, who passed away, would not be at his side. Thanks for all the wonderful emails, you are all so very thoughtful. Please keep the questions coming and read View from The Deck on Sunday as the 2-year-olds will be hitting the mid-teens this week. It will be exciting. Have a wonderful week.